It’s that time of year when the musical instrument, sound reinforcement and pro audio worlds gather at the Anaheim Convention Center in Anaheim, California to display their newest products to the industry’s buyers, retailers and distributors. Samson will introduce an exciting line-up of new and innovative products at NAMM 2019. From the latest Expedition rechargeable portable PA systems to the new AirLine Wireless microphone configurations, Samson offers the ultimate in power, performance and portability, while delivering an extraordinary amount of value. Included below is a preview of all the products that we will be showcasing at this year’s big event. The Resound VX8.1 is a portable column array system that delivers premium sound in a sleek, easy-to-transport package and is ideal for mobile DJs, bands, singer-songwriters and other performers that require high-quality sound reinforcement. 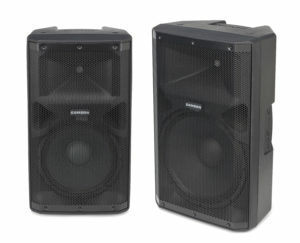 The active 700-watt system includes a 12″ subwoofer with a 3-channel mixer and eight 3.5″ drivers arranged in a vertical column array that provides 120°–200° of horizontal coverage. Learn more here. 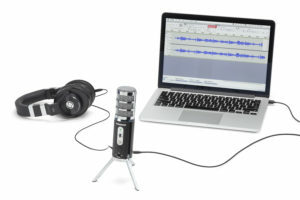 Samson Satellite is a broadcast-quality USB/iOS microphone designed for capturing high-definition audio on your computer, iPhone or iPad. 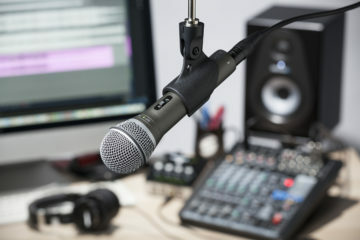 As an essential piece to any streamer, podcaster or content creator’s recording setup, Satellite offers plug-and-play operation, 24-bit/96kHz audio, three selectable pickups patterns and a patented fold-back leg design in a highly-portable package. Learn more here. 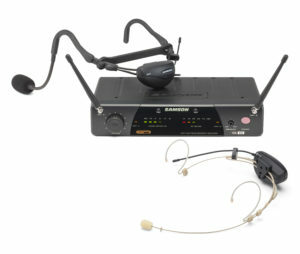 Samson has expanded its ever-popular headworn and lavalier microphone lineup with seven new microphones so performers, presenters, fitness instructors and broadcast professionals alike can find a solution to meet their specific needs. 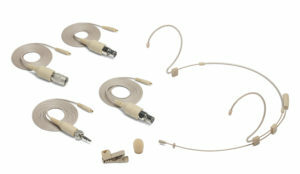 These include four headsets (DE10x, DE50x, DE60x and QEx), two lavaliers (LM7x and LM8x) and an earset (SE60x). Plus, each mic includes four detachable adapter cables that allow the mic to work with the most popular wireless transmitters right out of the box. Learn more by clicking each product link listed above. The AirLine 99m AH9 is a wireless microphone solution designed to meet the specific demands of active performers. Available in Headset and Fitness Headset configurations, this frequency-agile UHF wireless system combines the AH9 micro transmitter and AR99m micro receiver for a highly-portable, rechargeable setup that offers high-definition sound completely free of cables and beltpacks. Learn more by clicking each configuration listed above. 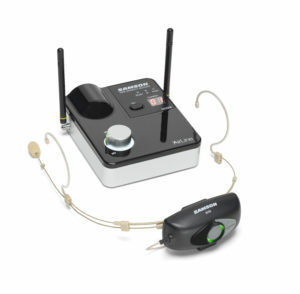 The AirLine 77 AH7 is a wireless microphone solution that is available in Headset and Fitness Headset configurations. The Headset system meets the demands of presenters, singers and performers, while the Fitness Headset system is ideal for the more intensive demands of fitness instructors. Both headset microphones feature the AH7 micro transmitter, freeing performers from cables and beltpacks. Learn more by clicking each configuration listed above. 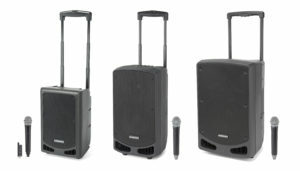 Expedition Rechargeable Portable PA systems are the perfect solution for anyone who needs great-sounding mobile audio. We’ll be showcasing five new models at NAMM, from compact portable speakers to large speakers that can replace traditional PA speakers (but are light enough to pickup with one hand). The Expedition XP208w Rechargeable Portable PA is a 200-watt, 8″ wireless speaker with 20 hours of battery life, Bluetooth audio and a 4-channel mixer with a guitar input and digital reverb. The system includes an XPD wireless handheld microphone and users can add a second XPD system for a completely cord-free performance. Learn more here. The Expedition XP310w Rechargeable Portable PA features 300 watts of power, 12 hours of battery life, and a top-mounted 4-channel mixer with Bluetooth, to make adding sound reinforcement for any event extremely easy. It includes a frequency-agile UHF wireless microphone for cord-free performance and can be expanded to incorporate three wireless systems. Learn more here. With 300 watts of power, 12 hours of battery life, a 4-channel mixer and Bluetooth, the XP312w Rechargeable Portable PA delivers huge sound to musicians, DJs or those enjoying a variety of outdoor events. It includes a frequency-agile UHF wireless microphone for cord-free performance and can be expanded to incorporate three wireless systems. Learn more here. The Expedition Escape+ 50-watt rechargeable speaker system is light enough to carry with one hand (weighing just under 10.5 pounds), while packing plenty of power to fill a room of up to 50 people. Stream audio from any Bluetooth device for up to 20 hours on a single charge to make those post-game tailgates rage on into the night. Learn more here. The Expedition Express+ 75-watt lightweight, rechargeable speaker system weighs just under 12 pounds and delivers rich, full sound to audiences of up to 100 people. Wirelessly stream music from any Bluetooth device for up to 20 hours on a single charge. 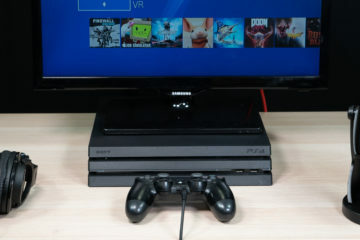 Plus, it comes with a wired handheld microphone and cable to add your voice to the mix. Learn more here. The RS112A and RS115A are 400W 2-Way Active Loudspeakers that offer powerful, versatile and convenient sound reinforcement to a wide range of audio applications. 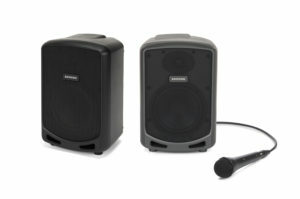 Easy to transport and set up, these powerful speakers each feature an onboard mixer with mic/line input options, Bluetooth audio streaming and a USB Wireless port for connecting Samson XPD Series wireless microphone systems. Learn more about the RS112A and RS115A. 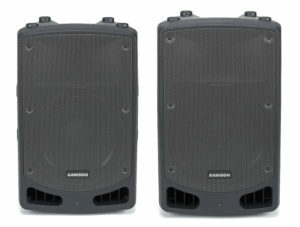 The RL112A and RL115 800W 2-Way Active Loudspeakers are the perfect balance of power, fidelity and portability, featuring an onboard mixer with mic/line input options and a USB Wireless port for integrating Samson XPD Series wireless microphone systems. Learn more about the RL112A and RL115A. The NAMM Show is one of the world’s largest, most important music product trade shows, attended by all of the industry’s premier decision makers. Alongside some of the music industry’s top players, Samson (Booth 14116, ACC North, Level 1) will showcase new products at the 2019 NAMM Show from January 24–27 at the Anaheim Convention Center in Anaheim, CA. For more information, visit NAMM.org.